You're all set up! 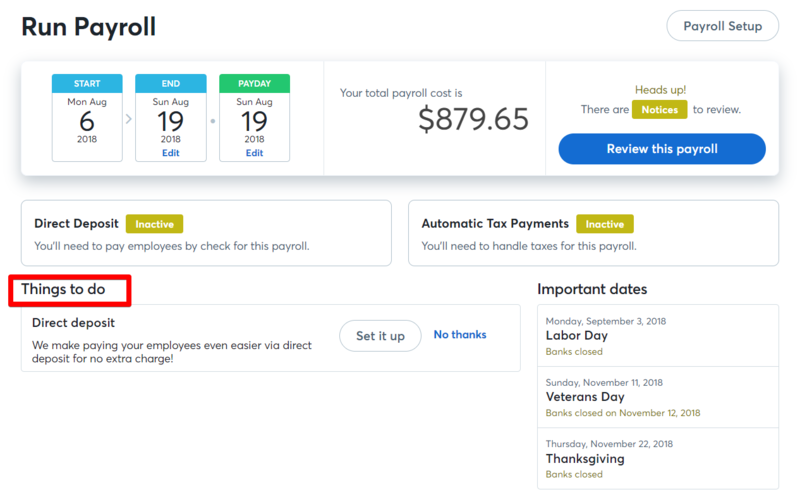 Running your payroll is just a button away. Here's how. Follow the steps below and pay your employees. There are a few areas of the dashboard you will want to consider before approving payrolls. Before you run your first payroll you must decide which pay frequency you want to use. To change your frequency, click the Change Frequency button on the dashboard next to your current frequency. The system currently defaults to biweekly when you create a payroll account. Weekly, Biweekly, Semimonthly, and Monthly are the available options. Once you run your first payroll, the frequency cannot be changed, so make sure you've chosen the correct pay frequency for your business. Weekly and biweekly are more flexible in that you can select the finish date, and is often preferred by employees as it makes budgeting simpler. Monthly is the easiest for you as you'll only need to approve payroll once a month, the downside being your employees are paid less frequently and must be better at budgeting. On the payroll home page, you'll see a calendar with the start and end dates of the pay period, and the payday. 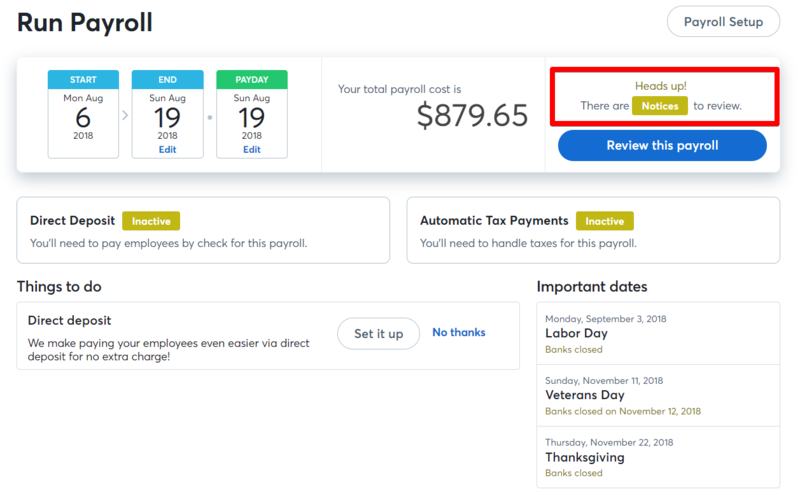 You can edit the pay period by using the Edit link on the End Date, and it will automatically adjust the start date based on your pay frequency. Note that you cannot edit the end dates for Semi-monthly and Monthly because Wave uses a fixed schedule: semimonthly is paid on the 15th and final day of the month and monthly is paid on the final day of the month. Please note that in order to pay employees via direct deposit, the funding cycle requires your payday to be at least four business days in the future. Check out the Things To Do list we've created for you. If you've completed all the steps in the guide, this should be empty right now. Going forward, payroll tasks other than approving payroll will be listed here as important dates arrive. We will alert you to any additional information Wave requires with Notices. You can address them by clicking on Review this payroll. If you have already completed the first five steps of setup you should not have any notices at this time. We want to make sure you run an accurate payroll, so you must address notices before you can run you first payroll. It's time! You're ready to Approve and run your payroll! Congratulations, you've completed the getting started guide and run your first payroll with Wave!